Note: Orders submitted after 2:00pm EST on Friday, on Shabbat, the weekend and holidays will be processed promptly on the next business day. Presented in a natural wooden tray with carved handles and tied with brown satin ribbon are a collection of almonds, roasted salted pistachios, smoke house almonds, and roasted salted cashews. A gift sure to be appreciated by friends and family. 1 lb, 4 oz. Every item is certified kosher by a leading kosher certifier. Gift is clearly marked with certification. The Kosher Gourmet Dried Fruit Tray is a wonderful way to send them your sweetest sentiments, set to give them a delicious and nutritious way to indulge! Presented in a natural wooden tray with carved handles and tied with a raffia ribbon are the following kosher dried fruits, including: dried pears, dried peaches, dried apricots, dried Blenheim Apricots, dried Angelino Plums, dates, date nut rolls coated with coconut, and prunes. A gift sure to be appreciated by friends and family. 2lbs. Every item is certified kosher by a leading kosher certifier. Gift is clearly marked with certification.. The Kosher Dried Fruit & Nut Tray is a great gift to help lend to the festivities of any occasion! Presented in a natural wooden tray with carved handles and tied with a brown satin ribbon are the following kosher snacks, including: dried pears, dried Blenheim Apricots, prunes, dates, date nut rolls coated with coconut, roasted salted mixed nuts, and roasted salted cashews. A gift sure to be appreciated by friends and family. 1 lb., 12 oz. Every item is certified kosher by a leading kosher certifier. Gift is clearly marked with certification. 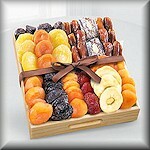 The Flowering Gourmet Kosher Dried Fruit & Nut Tray is a delicious and nutritious way to delight your special recipient! Presented in a natural wooden tray with carved handles and tied with a raffia ribbon are the following kosher snacks, including: dried pears, dried peaches, dried apricots, dried Blenheim Apricots, dried Angelino Plums, prunes, dates, roasted salted almonds, roasted salted cashews, roasted salted pistachios, and Cherry Berry Trail Mix. A gift sure to be appreciated by friends and family. 3lbs. 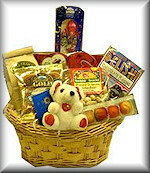 Send a basket filled with your love with our Teddy Bear love basket. Coffee, chocolates, Choc Rose, nuts, heart shaped chocolates & a beautiful Teddy Bear to hug! 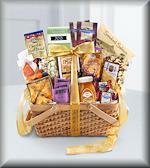 Arriving in a beautiful natural woven handled basket, this gift includes the following gourmet kosher items: 6 Tazo Tea Bags, 2 Ghirardelli Cocoa Packets, 4-piece baklava, 3 oz. Thatcher's Chocolate Drizzled Caramel Popcorn, 3 Ghirardelli Chocolate Squares, 2 oz. smoked wild salmon, 2 oz. Partner's Crackers, 2 oz. Gigi Biscotti Bites, 3 oz. roasted and salted unshelled pistachios, 5 oz. Sconza Caramelized Chocolate Cashews, 5-pz. Sconza Chocolate Fruit Basket, 6 oz. jar of honey and a 4 oz. bag of dried fruit. If you are interested in owning this domain name, please contact domains@factorllc.com with your offer.